4 Mass is a measure of an object's inertia, in other words its resistance to acceleration. In contrast, the intrinsic energy of an object [...][has] nothing to do with gravity. 9 C is a constant, right? 10 Einstein’s Relativity and Relativism: Why Einstein’s theory of relativity is actually a powerful argument for absolute truth. More than two years ago, I posed the following questions for Andy Schlafly to answer. I'd still appreciate an answer by him, making my wait worthwhile. 1. Do you accept that the mass of the Lithium-kernel (7Li), of alpha-particles (4He) and of protons (1H) can be measured fairly accurately, as these are charged particles? 2. Do you accept the measurements for the mass of the particles as used by Cockcroft¹ and Walton, i.e. If not, which values do you think to be right? 3. Do you agree that before the reaction the mass of the particles involved was 8.0202 amu? 4. Do you agree that after the reaction the mass of the particles involved is 8.00220 amu? 5. Do you agree that there is a mass decrease of 0.0180 amu? 6. Before the experiment, the Li was at rest and the proton had a kinetic energy of less than 1MeV. Do you accept these values? 7. After the experiment, a pair of alpha-particles was observed, both having an kinetic energy of 8.6MeV. Do you think that this value is correct? 8. Can you tell me where the mass went? Can you tell me where the energy came from? 9. If your answer to question 8. is no in both accounts, than my answer is that there is a theory which explains the conversion of mass to energy, even if you don't like it! I want to revisit the statement: For example, Robert Dicke, perhaps the greatest physicist of the 20th century, was denied a Nobel Prize because he doubted the Theory of Relativity. "perhaps the greatest physicist of the 20th century" - according to whom? "was denied a Nobel Prize because he doubted the Theory of Relativity" - where is the evidence for this claim? Take for instance the National Institute of Standards and Technology's summer-school of 2009, which allows grad-students and junior faculty to get their hands on their newest equipment: Here, NIST-physicist Maynard Scott Dewey shows how this can be used to test the equation E=mc² directly ("Neutron Binding Energy Measurements for a Direct Test of E=mc²" (pdf)) - and with a very good precision. Mass is a measure of an object's inertia, in other words its resistance to acceleration. In contrast, the intrinsic energy of an object [...][has] nothing to do with gravity. However, it is impossible for anyone pursuing an academic career in science to even question the validity of this equation. Political pressure, however, has since made it impossible for anyone pursuing an academic career in science to even question the validity of this nonsensical equation. This can't possibly be what you wanted. The version I left in was the second one, with "Political pressure", and "nonsensical". I disagree with "nonsensical", but it's your website. I agree with the near-impossibility of anyone doubting this equation to successfully pursue an academic career in science, though probably for the reasons you think. But I have taken out the word "since". It makes no sense in the current context; it may have made sense in an earlier context. Do a simple statement to introduce the subject in the first paragraph. Describe in detail what it is, and what it supposed to do. Describe the history of it, who first postulated it and why; who else seconded it. Describe anything that successfully uses it, confirms it, and so on. I agree with you - I don't think that this way of trying to make the formula plausible works. Most of what the public knows about it is ludicrously oversimplified and just wrong. The popular notion that I find most overwhelmingly stupid is the business about "it unlocks the secret of the atomic bomb". But the other quotes are nearly as bad. The "Description for the layman" section and the immediately following "Popularization of E=mc²" are really just a synopsis of this foolishness. I think that material needs to be in the article, but put into perspective as oversimplified popularization. I don't agree with the edit comment "this is an encyclopedia, not a tabloid. Phrases like 'universally connected in the public's consciousness' are non-encyclopedic, and speculative at best." The public's consciousness of this equation is an important part of an article about it, unless you are writing a serious scientific journal to be read only by scientists. We need to acknowledge that it's a "meme", and try to put that into perspective. The "Description for the layman" section gives four popular quotes, out of an article containing ten quotes. Of the ten quotes, only one is actually lucid, straightforward, and factually correct; ane that is the one (not one of the four) by Sheldon Glashow. The others are what one would expect if you ask scientists to explain it for laymen. Assuming that it's OK with you for the page to acknowledge that it's well known in society at large, I'd like to leave the "Description for the layman" section in, with a prefatory note that it is extremely widely misunderstood, and that attempts to explain it to the general public almost invariably fall flat. Then give four examples as before, but adding Glashow and removing Arkani-Hamed. I'd also like to leave in the reference to the PBS article, but choose a much better quote than that "ultimate energy" nonsense. And the "energy it carried would be proportional to its mass times 100 [that is, v] squared" stuff is just plain wrong. And stupid. And unhelpful. So can you give me a couple of days to think about this? Unless you want the whole "E=mc^2 in the public's consciousness" material to go away, in which case I won't bother. In response to SamHB, I appreciate your thoughtful remarks, but I didn't put the PBS quotation in the entry. Someone else did (I'm not bothering to check who, and don't want to criticize anyone for it). Other quotations may be better, but it is important first to clearly state what the assumptions are underlying the formula. Does it work backwards by trying to conserve energy within the framework of the Theory of Relativity? If so, then the formula derivation really is circular, and the mass is not really a meaningful rest mass. Instead, the mass is something manipulated to try to conserve energy from different frames of reference. C is a constant, right? Can you be more specific about "all the attacks on this page" and "one thing that everyone uses against CP"? 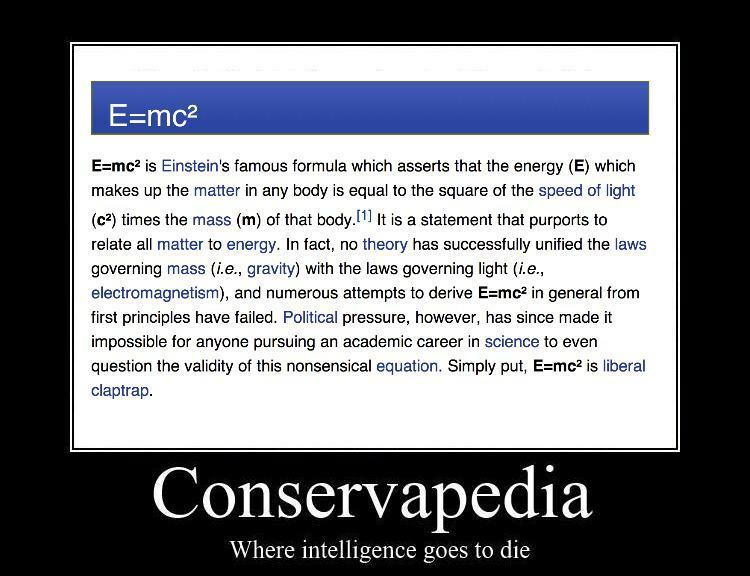 I'm not denying those attacks, but are you referring to all the attacks, from the outside world, against CP's pages on relativity (which you can get quite a lot of by Googling "Conservapedia+relativity")? Or are you referring to all the attacks on relativity by pages here at CP (such as the "liberal claptrap" reference)? Or are you referring to the apparent opposition between the part of this article above the table of contents and the part below? AugustO and I wrote essentially all of the material below the table of contents. We put a huge amount of meticulous work into it. I believe it adequately explains things in terms that non-experts can mostly understand. We try to stay away from the kinds of imprecise statements about "energy contained in matter" that one finds elsewhere. Thinking in terms of "this is a theory of the energy contained in matter" is not a clear way of thinking about the equation. Do you find the presentation confusing? Or perhaps you find other articles confusing? Or you find contradictions among the various articles on the subject confusing? I want to make this article give a satisfactory explanation. Please let me know how I can improve it. Got it. Yes, the criticism and arguing within CP is absolutely dwarfed by the criticism from outside. I referred to that in what I wrote in the Community Portal: Conservapedia:Community_Portal#Two_millionth_page_view_for_the_.22Counterexamples_to_Relativity.22_page. That page appears to be a lightning rod for criticism and scorn, and the "cpmonitor" web site is just one example. Very few of those two million views are from people who agree with it—my survey of Google references got 8000 hits, of which 98% were negative. The strong words that you see on this and other pages represent an attempt to fix the problem. There is no simple solution. Let's not reach for unwarranted conclusions. E=mc^2 was formulated in 1905 and experimentally verified around 1930; the gravitational wave announcement was only a few hours ago. These two phenomena are unrelated manifestations of relativity. Today's announcement does not confirm E=mc^2; it was confirmed long ago. As far as unification of the forces, today's announcement does not bring us any closer to a unification of mass, electromagnetism, or anything else. Unification of gravity with the other forces involves then ongoing research in "quantum gravity", that is, gravitons. As Professor Thorne made clear in today's announcement, the discovery of gravitational waves doesn't say anything about gravitons. Of the three articles cited above, the BBC article suggests that gravitational waves may help in future research into quantum gravity, but that is all. Einstein’s Relativity and Relativism: Why Einstein’s theory of relativity is actually a powerful argument for absolute truth. SamHB, you are being inaccurate and mischaracterizing the article. For example, where does the article say there is a connection between evangelical Christianity and Einsteinian Relativity? It doesn't. You made that up. The article merely resides at an evangelical website and says in the latter paragraphs that there is a basis for absolute truth and it mentions at the end of the article what the Bible says about creation/truth/etc. But that is not what the bulk of the article is about and you know this. You are being dishonest. In addition, there are plenty of groups within Christendom besides evangelicals who believe in absolute truth and believe that the Bible is the Word of God. Cons, I apologize for what I wrote above. I did not read the article that you cited—I very rarely read articles that you cite on websites of that sort. I simply assumed that, if the website was at "evangelicalfocus.com", and is about relativity vs. relativism, and you put this on the E=mc^2 page, that it related to Evangelical Christianity and Einsteinian Relativity. That was an unwarranted assumption on my part. I'll take your word for it that the article was about absolute truth. And I agree with you that lots of people, not just evangelicals, support absolute truth. For example, I do. But if you want people to see that article, I still think there are better places to cite it than here. I don't pretend to be an expert on relativity but I know of someone who works with atomic clocks who indicates he uses the theory. I believe relativity is a valid theory. "The formula asserts that the mass of an object, at constant energy, magically varies precisely in inverse proportion to the square of a change in the speed of light over time"
Just a couple of things. First unifying gravity and electromagnetism is not the same as unifying matter with light. This page was last modified on 11 September 2016, at 14:18. This page has been accessed 57,129 times.